WYPN premieres with two yearbook-themed podcasts, and plans to add more in the next year. The Walsworth Yearbooks Podcast Network (WYPN) launched today with two shows - Ask Mike and Yearbook Chat With Jim. 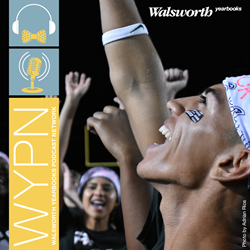 Walsworth Yearbooks is excited to announce the debut of the Walsworth Yearbooks Podcast Network (WYPN). WYPN premieres with two yearbook-themed podcasts, and plans to add more in the next year. The hosts of these two inaugural podcasts are well-known and respected in the yearbook world. Ask Mike, hosted by Mike Taylor, CJE, educates listeners on the pillars used to build a great yearbook. Taylor was an award-winning yearbook adviser before becoming Walsworth’s journalism specialist. In the first podcast episode, Taylor discusses finding a yearbook theme with his guests. In upcoming episodes, he’ll continue to build on essential skills used to tell a better story with their yearbook. He’ll cover the steps advisers take in the summer and how to prepare students to conduct great interviews. Yearbook Chat with Jim, hosted by Jim Jordan, shares the stories of the people creating yearbooks. Jordan spent 35 years advising an award-winning yearbook before joining Walsworth as a special consultant after retirement from teaching. In his first podcast episode, Jordan talks to three yearbook advisers as they reflect on their first years. In upcoming episodes, he’ll continue interviewing people with a compelling yearbook story to tell. Episode two will feature Sarah Lerner, the yearbook adviser who helped her students at Marjory Stoneman Douglas finish their yearbook after a school tragedy put them in the national eye. “Both Jim and Mike have immeasurable yearbook knowledge. They’re excellent hosts who are able to draw out their guests and hold listener attention. WYPN is fortunate to have them on board,” said Walsworth. These podcasts are available at walsworthyearbooks.com/podcasts and on all major podcast platforms. For any questions, please contact Alex Blackwell, Vice President of Marketing and Communications, at 800-369-2965, ext. 5769 or alex.blackwell(at)walsworth.com. Walsworth is among the 26 largest printing companies in the U.S. and is among the top-four yearbook printers. Started in 1937 by Don Walsworth, the company is still under the leadership of the Walsworth family and is the only American family-owned publisher of yearbooks. Walsworth operates from administrative offices and printing and binding facilities in Marceline, Missouri; a prepress facility in Brookfield, Missouri; a sales and marketing office in Overland Park, Kansas; and a printing facility in Saint Joseph, Michigan. Additionally, Walsworth owns the Donning Company Publishers in Virginia Beach, Virginia, a specialty book publisher, and The Ovid Bell Press in Fulton, Missouri, a printer of journals and magazines.